Unity requires these two things. The speaker must, first, have one main subject of discourse, to which he adheres with supreme reference throughout. But this is not enough. He must, second, propose to himself one definite impression on the hearer’s soul, to the making of which everything in the sermon is bent” (cited 24). 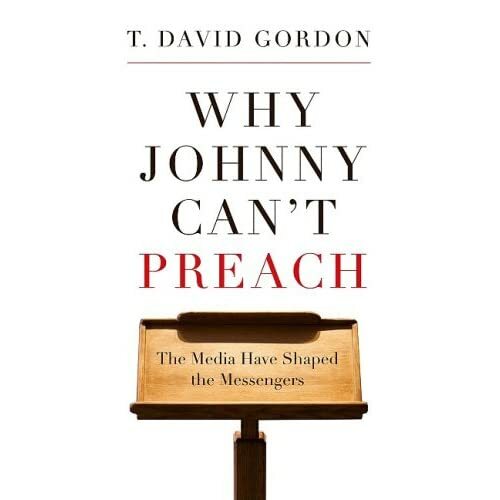 Gordon proposes this test: “If ten people are asked after the sermon what the sermon was about, will at least eight of them give the same (or a similar) answer?” (24). First of all, it would be very easy to say what a sermon is “about” if the sermon is topical. If you’re preaching on the subject of baptism, the congregation ought to be able to say afterwards, “That sermon was about baptism.” If you’re preaching on marriage, at least eight out of ten people should be able to identify the topic as marriage. But if you’re preaching on a text of Scripture, that criterion becomes much harder to apply. Sure, there are easier passages. If you’re preaching on 1 Peter 3:7, people should recognize that you’re talking about the calling of Christian husbands with regard to their wives (or, as eight out of ten congregation members might say if you asked them, “The sermon was about husbands”). But what if you were preaching on, say, the Ehud narrative in Judges 3. What’s that sermon “about”? Well, it’s about Ehud. It’s about Ehud assassinating Eglon, the fat king of Moab, and rescuing Israel and then leading to Israel to victory against the Moabites. It’s about Christ, who strikes the first decisive blow and then leads his church to victory. It’s about how God turns those who oppress his people into stinking piles of what you leave behind when you’re “covering your feet” and how he thereby makes his people laugh. You could say “It’s about deliverance” or “It’s about war” but how inadequate a summary that would be. Ask most congregation members and they might say “It was about Ehud.” But the inability to state one clear topic (“The sermon was about X”) doesn’t necessarily mean that there was a fault in the sermon. Second, I wonder about the emphasis on unity as opposed to diversity. When I was in seminary, I learned (and good training it was, too) to craft for my sermon a theme statement. It had to contain an active (not passive) verb and it ought to have the application implied, at least in nuce, something like “Paul summons us to adopt the mindset of Christ” for a sermon on Philippians 2:5ff. The sermon would then usually have two to four points drawn from the text, all related to that theme in some way. Again, that was good training and I’m thankful that I learned how to craft such a sermon and that I followed that practice for several years at the beginning of my ministry. But then he went on to ask why we would think that a passage could have only one possible theme. God, after all, is Triune. He is both one and three, both Unity and Diversity and the source of unity and diversity. There may, he said, be a number of different ways to sum up the theme of the passage, different things that one could bring to the surface, including some little details in the text that may not fit perfectly with the theme I had chosen but that still were in the text. It took a long while for his words to sink in, but I’m persuaded of them now. You might preach a text faithfully and yet have a different theme statement than I would have, and that wouldn’t necessarily mean that one of us had caught the theme of the passage correctly while the other hadn’t. It might just mean that you and I are bringing out different facets or aspects of the passage. I might think that something in verse 3 is particularly significant, but you might brush right past it and camp instead for a long time on verse 5. It might be possible to camp on both verse 3 and verse 5 and risk having people say, “I wasn’t sure if that sermon was more about X or about Y.” If X and Y are both in the passage, what does it matter if people think that instead of one main point you had two? In fact, when you’re preaching a passage of Scripture, isn’t the primary unity of the sermon found in its source, namely, that what you’re saying — though you might be talking about X and Y and Z — all is drawn from and relates to the one passage you’re preaching? As Jim Jordan taught me, God is one and three and his triunity is reflected in his word and may be reflected in our preaching. That’s not necessarily one theme and three points. It may be one sermon, one text, with three interwoven, intermingling themes. It may be that if pressed to say what a sermon was about, your congregation could reply, “It was about a lot of stuff — about deliverance and the importance of singing the psalms and about God remembering us and about justice and why we shouldn’t pray for God to look on us in mercy and not in justice and about how God turns the tables on our enemies and … well, it was about Psalm 9.” Unity, yes. And diversity.